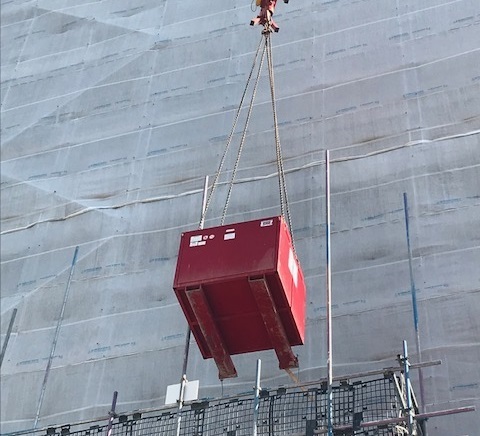 To remove the risk of a pallet of bricks becoming unstable on brick forks when being lifted to a high level with a tower crane, we have introduced the use of Brick Lifting Cages which fully contain a pallet of bricks/blocks and allow for safe contained lifting of such materials by 4 point attachment to a tower crane. These can be loaded by forklift on the ground floor and the pallet fully enclosed within the cage then lifted up onto a loading bay/working area. The cage can also be used to load any debris in such as brick off cuts, pallets and general waste and then lifted back down to the ground floor emptied into skip and then the cage is then ready for reuse/loading again. Mount Anvil have now introduced this method of using these cages to load out all bricks/blocks across all their sites to ensure the safest method possible is used on all their developments.